MPI believes that education is a continuous process. Initial training as well as training of specific functions should be made available to everyone involved, including machine operators, setup personnel, process engineers, and maintenance staff. To fulfill the need for training, MPI has developed the Smartech Education Program ™. The Smartech Education Program ™ is a comprehensive collection of training courses that has a specific focus on wax room operations. Each program is designed both with classroom and hands on wax room training. Training can take place at MPI’s state of the art training facility in Poughkeepsie, NY or MPI’s certified trainer can come to you. One of the advantages of having the training take place at your facility is that the trainer can instruct in your wax room using your machines and your wax dies. Adequate training means that your personnel will better understand the injection process helping them make good process decisions to produce the best quality wax patterns. This results in productivity gains as it reduces both scrap and improves cycle time and pattern quality. It also decreases casting scrap and rework—reducing casting costs. All classes are certified by MPI, incorporating our 40 plus years of industry experience to all programs. *These training classes require the individuals attending the class to have successfully completed the Robot Manufacturers Programming Class. This is a one-day training session that focuses on the basic operation and process control of wax injection machines. This is a one-day training session that focuses on setting up a new die, applying the injection process control methods from “Wax Injection Operation Training” course to optimize the injection focusing on pattern quality and best cycle times. This is a half-day training session that focuses on operation of the Wax Injector Smart Controls™ System. Note: The wax room training requires an MPI injection machine with Smart Controls™. This is a one-day training session that focuses on wax injector maintenance and how to optimize the performance of MPI Equipment. The training class includes a walk around the machine identifying and reviewing the specific maintenance areas on the equipment. The hands on portion of the class can be modified to meet customer specific requirements by combining it with preventative maintenance of the equipment. This enables your maintenance personnel to perform actual procedures on the machine with guidance from MPI’s certified instructor. Detailed review of daily, weekly and annual inspections. Conduct a preventative maintenance event on one machine specified by the customer prior to the training course; if this training is conducted at MPI, the preventative maintenance event will take place on an MPI Pattern Production injector. This is a one-day training session that focuses on the basic operation and process control of ceramic injection machines. This is a one-day training session that focuses on setting up a new die, applying the injection process control methods from the Ceramic Injection Operation Training course to optimize the injection focusing on pattern quality and best cycle times. This is a one-day training session that focuses on ceramic injector maintenance and how to optimize the performance of MPI Equipment. The training class includes a walk around the machine identifying and reviewing the specific maintenance areas on the equipment. The hands on portion of the class can be modified to meet customer specific requirements by combining it with preventative maintenance of the equipment. This enables your maintenance personnel to perform actual procedures on the machine with guidance from MPI’s certified instructor. This is a one-day training session that focuses on operation of the Injection Cell Smart Controls™ System. Class is typically customized to include customer-specific functionality supplied with the cell. Class covers the operation of the cell only; it does not cover operations specific to wax injection. The wax room training requires an MPI injection cell with Smart Controls™. Class applies to both wax and ceramic injection cells. This is a one-and-a-half-day training session that focuses on advanced operation of the cell, including methods for introducing a new product to the cell. This class includes a Smart Controls™ recipe setup and robot programming. This class covers the operation and programing of the cell only; it does not cover operations specific to wax injection. All individuals attending the class must have successfully completed the Robot Manufacturer’s Basic Programming class. This is a one-day training session that focuses on Injection Cell maintenance and how to optimize the performance of MPI Equipment. The training class includes a walk around the machine identifying and reviewing the specific maintenance areas on the equipment. The handson portion of the class can be modified to meet customer specific requirements by combining it with preventative maintenance of the equipment. This enables your maintenance personnel to perform actual procedures on the machine with guidance from MPI’s certified instructor. Conduct a preventative maintenance event on one machine specified by the customer prior to the training course. If this training is conducted at MPI the preventative maintenance event will take place on an MPI Pattern Production injector. The hands on wax room training requires a MPI injection Cell with Smart Controls™. This is a one-day training session that focuses on operation of the Automated Wax Assembly Cell Smart Controls™ system. Class applies to both MPI’s Model 20-14 and Custom build Wax Assembly Cells. The wax room training requires an MPI Assembly Cell with Smart Controls™. This is a one-and-a-half-day training session that focuses on advanced operation of the cell including methods for introducing a new product to the cell. Class includes Smart Controls™ recipe setup and robot programming. 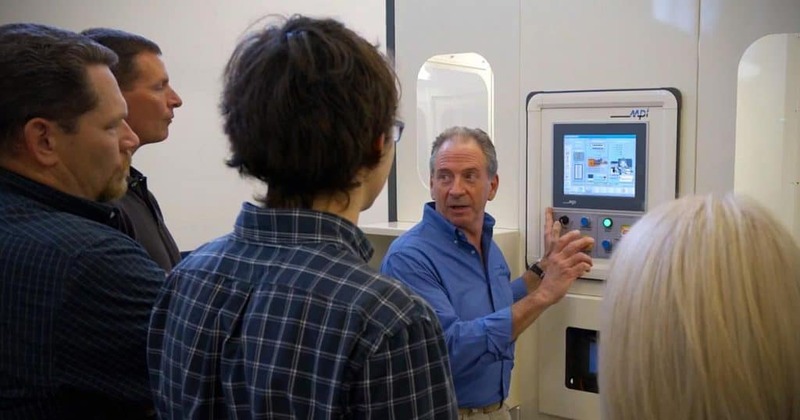 The wax room training requires an MPI Automated Wax Assembly Cell with Smart Controls™. This is a one-day training session that focuses on Automated Wax Assembly Cell maintenance and how to optimize the performance of MPI Equipment. The training class includes a walk around the machine while identifying and reviewing the specific maintenance areas on the equipment. The hands-on portion of the class can be modified to meet customer-specific requirements by combining it with preventative maintenance of the equipment. This enables your maintenance personnel to perform actual procedures on the machine with guidance from MPI’s certified instructor. Classroom training that is tailored to maintenance personnel. Overview of MPI Smart Controls™ and assemblies. Conduct of a preventative maintenance event on one machine specified by the customer prior to the training course. If this training is conducted at MPI the preventative maintenance event will take place on a MPI Pattern Production injector. The hands-on wax room training requires an MPI Automated Wax Assembly Cell with Smart Controls™. Basic review of pattern defects and how to overcome them. The wax room training requires the Model 20-20 connected to an injection machine. MPI’s training programs cover machine standard features and options. Each program utilizes the latest equipment features with MPI’s Smart Controls. Most of the information is applicable to all vintage injectors however, the material will not specifically demonstrate examples for older equipment or custom features supplied on the equipment. This is most noticeable when presenting the Smart Controls and Maintenance Training programs. The standard training programs will not cover the machine’s custom features or controls options that may be critical for your personnel to understand. It for these reasons MPI offers personalized custom training programs that can be catered to your specific equipment, to your specific needs. Contact MPI’s Sales department for further information. This training can be offered at your location and presented concurrently with the preventative maintenance program (PMP). When performed with PMP on a single machine, the training and PMP is a three-day session. The classroom training is supported by hands-on maintenance on your machine. This will be performed by an MPI technician while your maintenance staff observes and assists. This can be augmented by having additional machine preventative maintenance performed by your maintenance staff while MPI’s technician supervises their work.